There’s no better month than October to get stuck into your spring garden and prepare it for the harsh heat of summer. Here are some gardening ideas and tips to use this month. Plant summer-flowering bulbs such as gladiolus, Galtonia, Amaryllis, tuberose and dahlias. 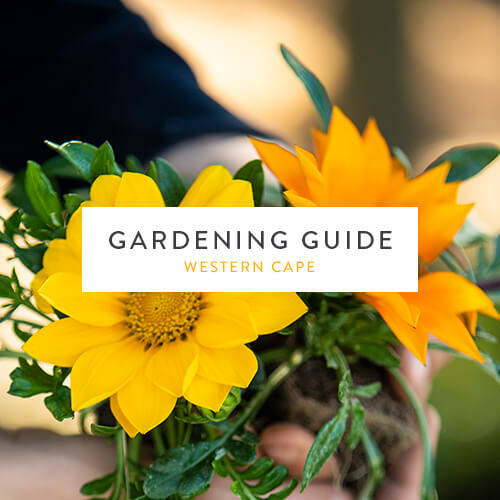 Plant flower seedlings in sun-exposed areas, such as petunias, hydrangeas, Sweet alyssum, gazanias, penstemons, Chrysanthemum paludosum and Chrysanthemum multicaule, Sunpatiens and celosias. Sow seeds such as candytuft, alyssum, Californian poppy, cornflower, cosmos, dianthus, phlox, verbena, zinnia, marigold, cineraria, Lavatera and lobelia. Grow summer veggies such as beetroot, broccoli, carrots, celery, cucumber, eggplant, lettuce, parsnips, pumpkin, radish, peppers, tomatoes, spinach and Swiss chard. Focus on planting a drought-resistant garden that’s sculptural in form. We’re loving cacti and succulents because of their water-wise properties and low-maintenance upkeep. Give indoor and outdoor plants extra sustenance with a liquid fertilizer such as Multifeed or Seagro. Fuchsias, bulbs and other spring annuals should be fed with a 3:1:5 fertiliser every 2 weeks. Established lawns could do with 4:1:1 fertiliser. We recommend a handful for every square metre. Apricots, peaches, plums and quinces would all thrive with a 3:1:5 fertiliser. Tidy up hibiscus, bottlebrush, protea, tea bush, butterfly bush, poinsettia, confetti bush, potato bush, plumbago and conifer. Cut back flowering apricots, peaches, plums and quinces to encourage stockier, sturdier growth and enhance light exposure. Deadhead pansies and violas regularly to keep them flowering for longer. Remove faded flowers from spring annuals and bulbs. Aloe vera (also known as Aloe barbadensis) is the most commonly used medicinal plant in the world with over 250 species of aloe, most of them native to Africa. This short-stemmed succulent grows best in dry conditions, making it the perfect plant to grow in a drought. Aloe plants should be grown in full sun or light shade and should avoid being overwatered. To prevent moisture from evaporating too fast, fill the soil around the roses with rich mulch. Use grey water to keep your garden looking lush – just be careful to use grey and not black water. Remove weeds from your rose garden regularly to prevent them from soaking up water.